Pudget: Losing Weight On a Budget! : You Are What You Eat! I'm really excited to share this post with all of you. 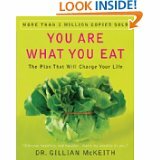 This past weekend I bought a book called "You Are What You Eat" by Dr. Gillian McKeith. I'm sure some of you may have already heard of it but I am so excited about it that I have to share it anyway. So far I think this book is awesome! It teaches you how to become a healthier person. It's exactly what I have been looking for. Someone to spell out word for word what I need to do to become healthier. I love that this book shows us how we can look at our own bodies (ex. tongue, feet, hands, ears, eyes) and tell what it is we are doing wrong and what we can do to fix it. The amount of information in this book is amazing. Actually the amount of information in the book may seem a little overwhelming but I have just been taking it one step at a time. There are so many changes that I need to make in my life in order to become healthier but I obviously can't do them all at once. Right now I am picking out what seems to me to be the most important/doable changes. I actually went to Walmart tonight after work and picked up a few new things that were suggested in the book. She suggest drinking lots of hot tea. She even listed several of her favorites and what they are best for. I bought Java tea which is known to relieve stress. I also bought chamomile tea which is also good for relaxation. I'm sure you all know by now that I suffer from insomnia so I am hoping that these teas will help in that area. I also picked up a big bag of raw almonds. The author of the book is really big on eating lots of nuts and seeds. She has many reasons that I can't think of right now but it is all listed in the book. I also picked up some organic veggies for salads, some sweet potatoes (which I think she said gives you energy), Peaches and several other items. I will write about them in another post as I remember. One of the biggest reasons I love this book is because she has spelled out so clearly what food combining is and how to properly do it so that your body can digest easier and also aid in weight loss. It's all so simple and I can't wait to try it. The one thing that I don't really like is that she suggests that you don't drink coffee because of the caffeine. :( I'm not sure I can make that change. I really enjoy my one cup of coffee each morning. Baby steps, right? This book also has so many different healthy foods listed that I have never heard of. I love to try new things so I am super excited to try them. I just hope I can find them where I live. Not only does the book have these healthy foods listed but it also gives a description of them and the reasons why they are good for you. I have to say that I have loved everything about this book so far but what I really do love the most is that this book not only has information on eating healthy but it also has so many tips on how to lose weight. It is just so nice to have all of this information in one book with everything spelled out for you. I don't have to search through several different books to learn how to eat healthy. It is all in one little book. Love it!!! If you couldn't already tell I am thoroughly impressed with this book. I can't wait to really dig into it further and start testing out all of Dr Gillian McKeith's ideas. I will continue to share all of my discoveries along the way. If you want to buy a copy of this book for yourself you can click here. I was able to find it on Amazon for almost $5.00 cheaper then I paid at the store. I was also excited to find that Dr. Gillian McKeith has a "You Are What You Eat" Cookbook. The review of this book is my opinion. I was not asked to write a review on this book nor was I given anything in exchange for writing this review. I'm kind of a health nut (In spite of my weight problem) but I can't bring myself to give up coffee. With half and half. I limit myself to 2 cups a day most of the time but I make it seriously strong. What I decided is coffee is such an enjoyable experience for me I'm not willing to give it up. Unless a specific health problem directly related to coffee presents itself I'm going to keep drinking it!